The RM 1 is a Vacuum Tube Tester easy to handle, in it's construction almost unique, which enables a fast, simple and precise plate current measurement (emission test) of the most common double triodes (6SL7-GT, 12AT7=ECC81, 12AU7=ECC82, 12AX7=ECC83)¹ and power pentodes (6CA7=EL34, KT66, KT88, 6550, 6L6-GC, 5881, 6V6-GT, 6BQ5=EL84)¹. The device captivates by a stressed classical outfit, primarily consisting of a solid beech wood cabinet and a surface of anodized aluminium. Because of its small dimensions it is easily transported and it doesn't need a lot of space for accommodation. Using the RM 1 Tube Checker it is immediately possible to do an exact plate current measurement without doing the often very toilsome procedures mostly necessary with classical devices. Put the electron tube, which should be measured, simply into the accordingly marked test socket, switch the tester on, select the socket by using the rotary switch (it is indicated by a LED), wait for approx. three minutes till the tube is working stabile and read off the value on the panel meter - see also video about the handling of the RM 1. Because all operating voltages produced during the measurement inside the RM 1 are stabilized and only selected components are used in the Tube Checker, the RM 1 delivers precise measuring results, which are mostly not reached by many historical devices - so you can measure and match tubes perfectly. ¹On request it is possible to design or re-equip the RM 1 Tube Tester for measurement of other vacuum tube types! For triode fans, for example, it is possible to replace the test socket EL84 by a 300B socket or to change the wiring and connection of an ECC82 socket, so that the values for a 12BH7 twin triode or an EZ81 rectifier tube can be determined. Our price list and image gallery gives more details and examples for custom-made devices. The scope of supply includes detailed operating instructions, a conversion table and the nominal values of the tube types which can be tested. We like to answer questions about the RM 1 at any time. 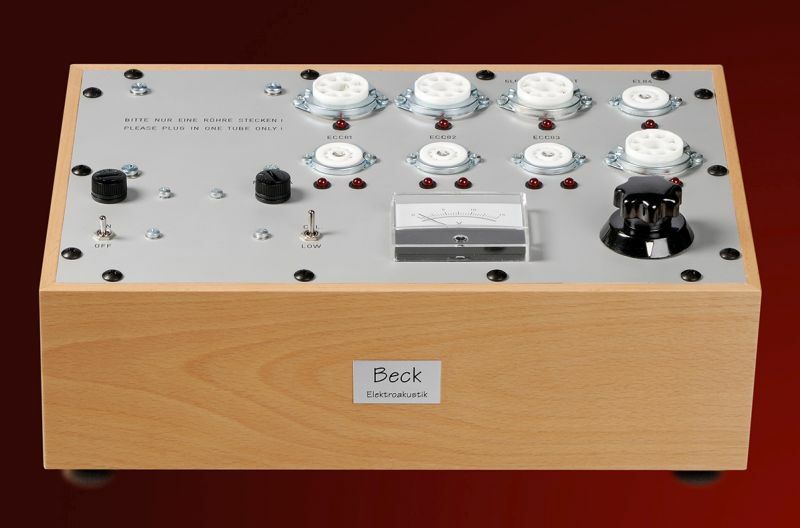 Just send an e‑mail to beck.elektroakustik@t‑online.de.